Encinal Elementary School in Atherton held its annual Cultural Arts Day celebration yesterday (Feb. 27). Conceived six years ago, the annual festival has explored the history and culture of Spain, Mexico, the Polynesian Islands, Uganda and China to date. 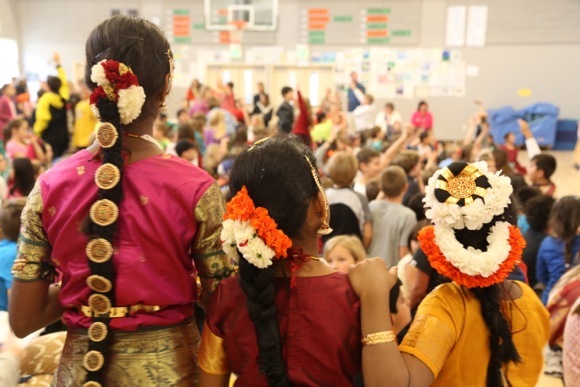 This year, the entire student body of 780 students learned about India. The day kicked off with an introductory video, followed by a cricket demonstration and a visit to an on-site museum filled with art and artifacts from India. During lunch, the students sampled several Indian foods, practiced yoga or created their own Rangoli art on the playground. Professional sitar and tabla players Aharon Wheels Bolsta and Joanna Mack also performed for the children. One of the many highlights of the day was a classical dance performance by the Pushpanjali Dance Company of Sunnyvale. It was followed by a Bollywood dance headlined by Lee Pazmino, who has toured with Justin Timberlake and Christina Aguilera, and is also a teacher at the Menlo Park Academy of Dance. In the classroom, parent volunteers presented a history and culture lesson, read a story about India and helped students complete an elephant art project that was personalized with the students’ names written in Hindi. Encinal’s annual Cultural Arts Day is exclusively for the Encinal student body, staff and parent volunteers. Over 100 volunteers helped make the day a success. Menlo Park bicycle and pedestrian commuters to Stanford and Palo Alto were greeted this morning by a stuffed bunny perched on the bike bridge that crosses San Francisquito Creek near the golf course.